Chemins de fer de l'Europe. 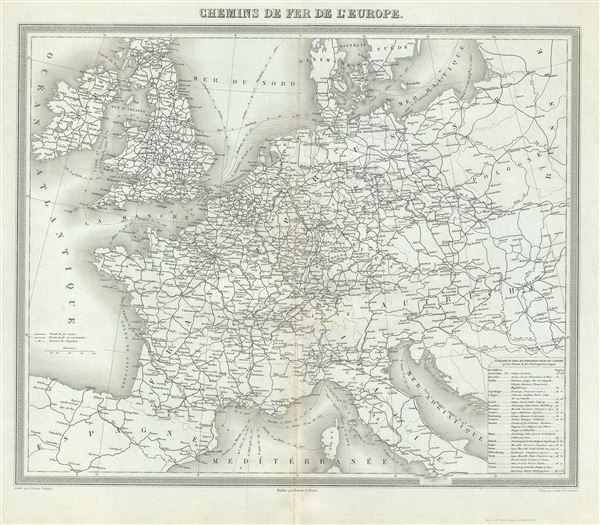 This is an example of Ambroise Tardieu's 1874 map of Europe showing railways. It covers part of the continent from England south to Spain and the Mediterranean and east as far as Russia. Notes important railway lines as well as shipping lines throughout. This map depicts a period shortly following the unification of Italy and the rise of the British Empire to the apex of power and influence. It was also a time of decline for the Ottoman Empire. This map follows the period immediately after the Franco-Prussian War and the unification of Germany. Throughout, the map identifies various cities, towns, rivers, islands and an assortment of additional topographical details. This map was prepared by Ambroise Tardieu and issued in his 1874 edition of Atlas Universel de Geographie Ancienne et Moderne.